1 I. PennDOT Regional Operations II. III. IV. Statewide Traffic Management Center (STMC) Advanced Traffic Management System (ATMS) Pennsylvania Turnpike Commission (PTC) Operations I. PennDOT Regional Operations PennDOT is making a move from three Regional TMCs (RTMCs) to four, to focus regional operations in a corridor-based approach that encourages more efficient regional and interregional cooperation. Regions were originally aligned based on existing capabilities, and mixed largely rural with largely suburban-urban areas. Device management was vastly different and operational expectations were vastly different within a region. The four-region model allows Philadelphia and the Southeast to remain its own region and unites eastern Districts 4, 5, and 8 to manage the entire I-78, I- 81, I-83, I-84 and I-380 corridors within a single region, instead of forcing multiple center management of a corridor. The new central region will focus on I-99, the non-interstate east-wests that serve large rural corridors, and take a broader look at the I-80 corridor from a central point, seeing both western and eastern impacts. The western region remains largely unchanged. As part of the alignment effort, a standardized approach to regional TMC operations has been created, which makes each of the four RTMCs more responsible for the daily management of operations within its region on a 24/ basis. Each District completes a District TOP, and those District TOPS are united in the Regional TOP which outlines how the RTMC will act as the member TMC when it is not staffed, or when access to facilities, personnel, or systems is compromised. Each District TOP may have a variety of how to approaches, but all of them will meet a specific statewide standard on what must be done and why it is important, as well as how each activity fits into a larger all-hazard, multi-jurisdictional, multi-disciplinary approach to incident and special planned event management. 2 Management of Interstates is more coordinated The line of responsibility is clearer from District to host Regional TMC The standardized approach to physical requirements, staffing requirements, and responsibilities and creation of standardized TOPs facilitates an understanding of responsibility when one TMC must take over for another when not expected (Continuity of Operations focus) II. 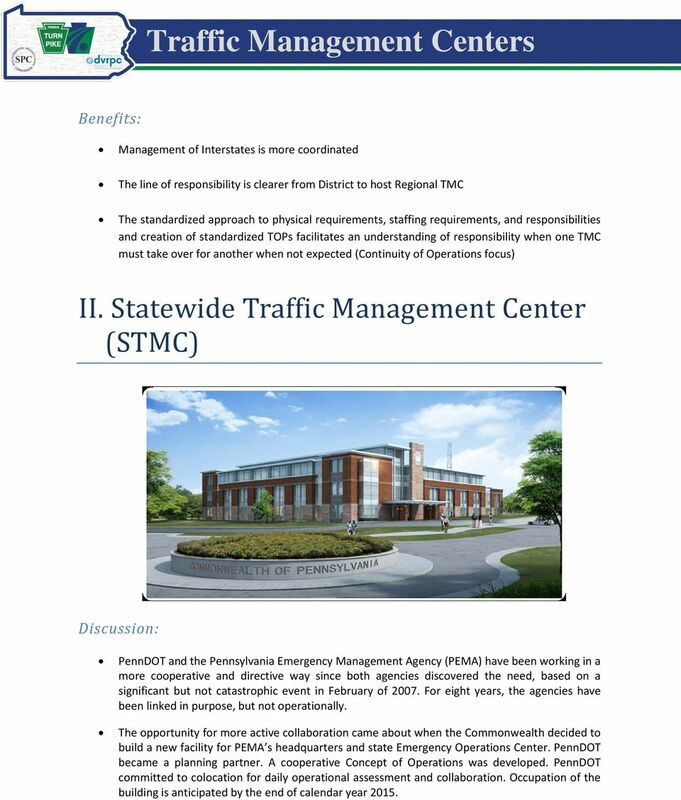 Statewide Traffic Management Center (STMC) PennDOT and the Pennsylvania Emergency Management Agency (PEMA) have been working in a more cooperative and directive way since both agencies discovered the need, based on a significant but not catastrophic event in February of For eight years, the agencies have been linked in purpose, but not operationally. 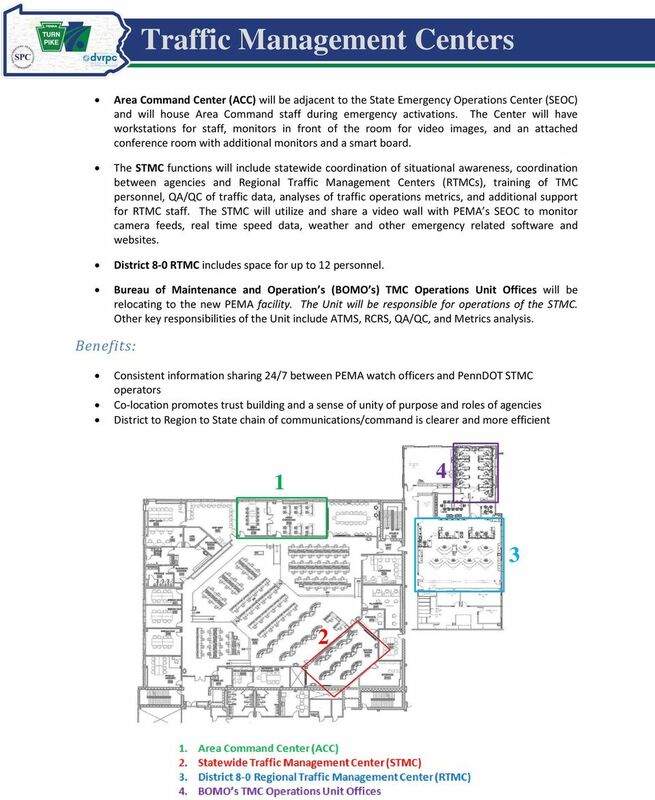 The opportunity for more active collaboration came about when the Commonwealth decided to build a new facility for PEMA s headquarters and state Emergency Operations Center. PennDOT became a planning partner. A cooperative Concept of Operations was developed. 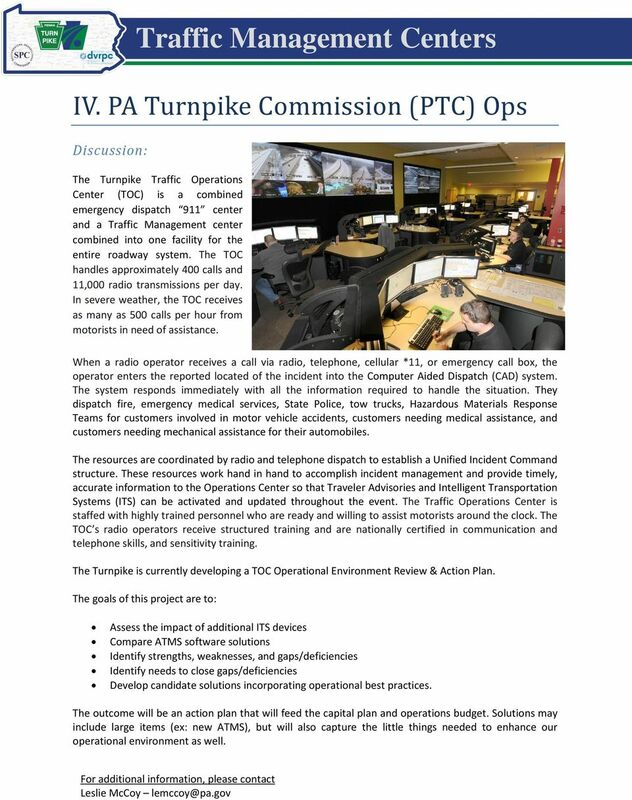 PennDOT committed to colocation for daily operational assessment and collaboration. Occupation of the building is anticipated by the end of calendar year 2015. 4 III. 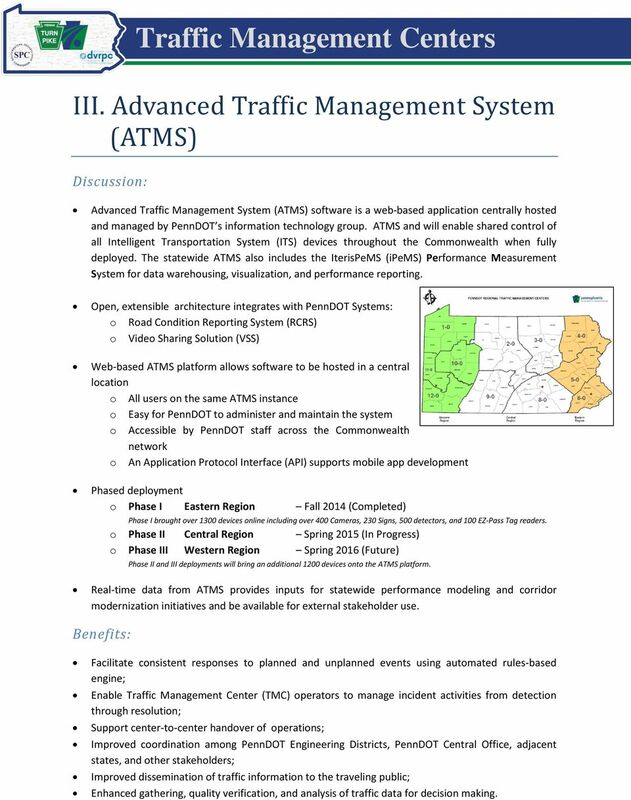 Advanced Traffic Management System (ATMS) Advanced Traffic Management System (ATMS) software is a web-based application centrally hosted and managed by PennDOT s information technology group. ATMS and will enable shared control of all Intelligent Transportation System (ITS) devices throughout the Commonwealth when fully deployed. The statewide ATMS also includes the IterisPeMS (ipems) Performance Measurement System for data warehousing, visualization, and performance reporting. Open, extensible architecture integrates with PennDOT Systems: o Road Condition Reporting System (RCRS) o Video Sharing Solution (VSS) Web-based ATMS platform allows software to be hosted in a central location o All users on the same ATMS instance o Easy for PennDOT to administer and maintain the system o Accessible by PennDOT staff across the Commonwealth network o An Application Protocol Interface (API) supports mobile app development Phased deployment o Phase I Eastern Region Fall 2014 (Completed) Phase I brought over 1300 devices online including over 400 Cameras, 230 Signs, 500 detectors, and 100 EZ-Pass Tag readers. o Phase II Central Region Spring 2015 (In Progress) o Phase III Western Region Spring 2016 (Future) Phase II and III deployments will bring an additional 1200 devices onto the ATMS platform. Real-time data from ATMS provides inputs for statewide performance modeling and corridor modernization initiatives and be available for external stakeholder use. Facilitate consistent responses to planned and unplanned events using automated rules-based engine; Enable Traffic Management Center (TMC) operators to manage incident activities from detection through resolution; Support center-to-center handover of operations; Improved coordination among PennDOT Engineering Districts, PennDOT Central Office, adjacent states, and other stakeholders; Improved dissemination of traffic information to the traveling public; Enhanced gathering, quality verification, and analysis of traffic data for decision making. Pennsylvania Turnpike Commission I-276/I-95 Interchange Project Design Management Meeting Summary - DRAFT Meeting Purpose: Design Advisory Committee Meeting #3 Date and Time: January 17, 2006 at 2:00 p.m.
CHAPTER 120c. TRAINING AND CERTIFICATION STANDARDS FOR 911 EMERGENCY COMMUNICATIONS PERSONNEL Sec. 120c.101. Purpose. 120c.102. Definitions. 120c.103. Certification of county or municipal training programs.